The Best Etiquette Blogs from thousands of Etiquette blogs in our index using search and social metrics. We’ve carefully selected these websites because they are actively working to educate, inspire, and empower their readers with frequent updates and high-quality information. Also check out Etiquette Youtube Channels. About Blog It is my sincere hope you find my blog insightful, inspiring and most of all fun. Here you’ll find timely posts with tips on everything from business etiquette to lifestyle etiquette, written from a modern manners perspective. Facebook fans 5,542. Twitter followers 7,073. Orlando, FL About Blog Maralee McKee: America's manners mentor. Maralee's guide to Manners and Etiquette. Good manners for children, Work Etiquette, technology manners, Etiquette for children, Dinning Etiquette, Social Etiquette, Corporate Etiquette, Wedding Etiquette, Telephone Etiquette, Eating Etiquette, Business Etiquette. Facebook fans 9,476. Twitter followers 1,212. Pennsylvania About Blog Learn about teaching manners to children or how you can become a certified etiquette instructor. Read our Manners To Go blog posts. Facebook fans 8,722. Twitter followers 180. Seattle About Blog Hello and welcome to the Clise Etiquette blog, a place to discuss savvy and not so savvy decorum. Etiquette may sound like a stuffy or old-fashioned topic, but it’s really just about making yourself and others more comfortable and successful by being respectful, kind and professional.I am an etiquette consultant, speaker, trainer, coach and author of Spinach in Your Boss’s Teeth: Essential Etiquette for Professional Success. Facebook fans 2,894. Twitter followers 2,088. Orange, CA About Blog The Candace Smith Etiquette Blog has lots of tips and guidelines on dining, social, and business etiquette. Have your etiquette questions answered! Facebook fans 731. Twitter followers 876. About Blog Syndi Seid is a recognized world’s leading authority on international business protocol and social etiquette. An international business protocol and socal etiquette training, coaching, consulting, speaking business with affiliate offices worldwide. Facebook fans 232. Twitter followers 212. Toronto, Canada About Blog Corporate Class provides the most comprehensive training available to enhance professional presence in today’s demanding business environment. Facebook fans 1,202. Twitter followers 1,937. Sandton, Johannesburg About Blog Teaching professional social skills, body language, manners, peak performance, relationship building, respect and care for others..The School of Etiquette arms people of all ages with the soft skills to interact confidently in any social or professional environment. Facebook fans 3,466. Twitter followers 304. New York City and Southampton, NY About Blog The Etiquette School of New York in Manhattan offers a complete program of etiquette classes for individuals of all ages, schools, private clubs and corporations. Patricia Napier-Fitzpatrick founded the school in 2003. Facebook fans 1,544. Twitter followers 1,930. About Blog Lifestyle & Etiquette Expert Elaine Swann blogs about her life, modern manners, and everyday life, style, and living.Elaine Swann is devoted to equipping individuals with basic instruction, materials, and products to help them foster good manners, project a professional image, and increase their everyday style. Facebook fans 1,569. Twitter followers 1,143. New York, NY About Blog Maggie Oldham is the original Modern Etiquette Coach and etiquette expert. Through her workshops, speaking engagements, and blog, she provides expert etiquette advice for successfully and confidently navigating modern life situations for the 21st century — from upscale dinners and chic pool parties, to business meetings and everyday social occasions. Facebook fans 1,215. Twitter followers 603. Tulsa, Oklahoma USA About Blog Your success begins with a polished, professional presence. We can help you outclass the competition with business etiquette and protocol skills. Facebook fans n/a. Twitter followers 1,388.
https://twitter.com/lydiaramseylive About Blog Lydia Ramsey is an international business etiquette and modern manners expert. She is the president and founder of Lydia Ramsey, Inc., a firm based in Savannah, Georgia, offering seminars, keynote speeches and executive coaching to corporations, associations, colleges and universities. She began her career as an etiquette consultant over thirty years ago. Facebook fans 205. Twitter followers 529. About Blog Grant Harrold, ‘The Royal Butler’ and ‘Defender of Etiquette’, has been described as ‘Britain’s Etiquette Expert’ and ‘One of Europe’s Top Guru’s on Etiquette’ (EasyJet) due to his background and teaching on the subject for almost 20 years. Facebook fans 1,328. Twitter followers 21,230. New Jersey About Blog Pachter’s Pointers provides weekly business etiquette tips and career suggestions to help people present themselves professionally in today’s business world. Topics include making conversation, business dining tips, presentation skills, communication, social media (Facebook, LinkedIn, Twitter), assertiveness, professional/business casual dress, email, being polite, verbal/nonverbal communication, interview tips, global etiquette, mingling, entrepreneurs, job search, internships and conflict. Facebook fans 3,333. Twitter followers 11,397. Orlando, FL About Blog Jacqueline Whitmore, CSP, is an international etiquette expert, author, and spokesperson who has helped thousands of people around the world learn to be more confident and courteous in business and social situations. Facebook fans 4,376. Twitter followers 12,029. Tampa Bay & NYC About Blog Business Etiquette Coach, Speaker and Author. Patricia is the go to person for etiquette knowledge and experience in television, radio and print media. She is featured on NBC Daytime’s One Minute Manners. Facebook fans 1,475. Twitter followers 36,009. Atlanta About Blog Peggy M. Parks is the South’s Brand/Image Leader, working with companies and associations to ensure that employees at every level of the company represent the corporate brand and message, both internally and when they interact with the public. Although good manners is nearly an ancient concept, companies that promote this idea are considered avant garde in this day and age. Facebook fans 253. Twitter followers 282. Michigan, USA About Blog Detroit Delivers, LLC provides concierge level personal assistant and etiquette services to successful women and businesses in the city of Detroit with the aim of an obstacle free road to a path of even greater success. We aim to help you organize your lifestyle. We will streamline your lifestyle with services that alleviate the non-essentials all with the additional function of helping you polish your personal presentation through our etiquette services. Facebook fans 255. Twitter followers 647. Greater Vancouver About Blog We believe that the art of treating people with consideration, respect, and being self-aware is something that cannot be lost through the ages. We provide our students with the confidence and skill set to integrate in a variety of social settings. Through interactive games, discussions, and hands-on practice, we believe that people learn best when we are engaged in the content being taught. Facebook fans 260. Twitter followers 83. Facebook fans 863. Twitter followers 1,379. About Blog Jacquelyn Youst is a modern manners & image expert, and owner of the Pennsylvania Academy of Protocol. Jacquelyn provides image consulting and a fresh, fun, modern twist on teaching social etiquette. Facebook fans n/a. Twitter followers 1,049. Sydney About Blog Business & Social etiquette consultant, author of Etiquette Secrets, Grammarian. 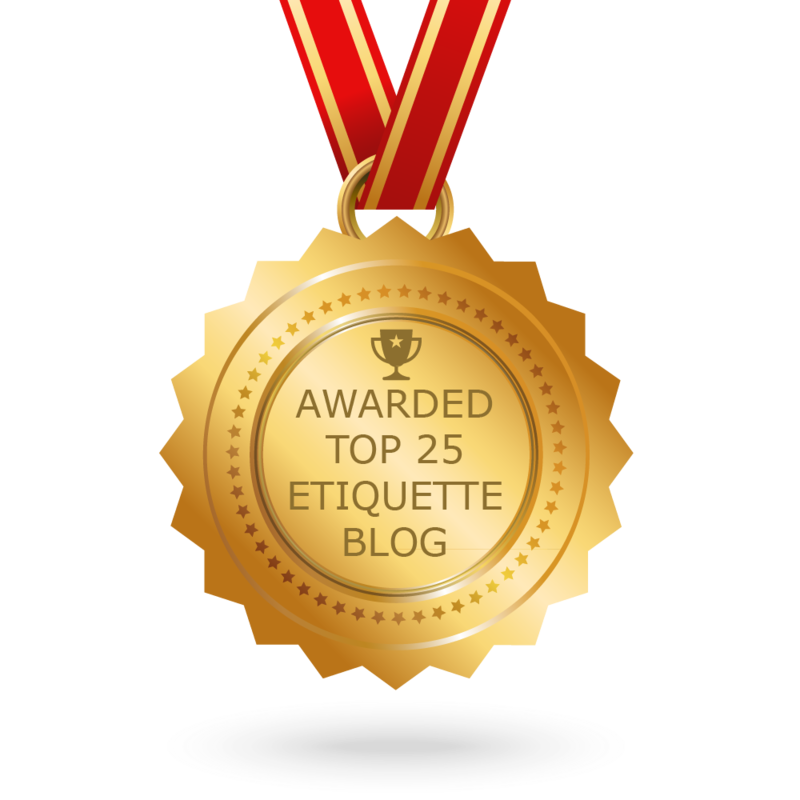 CONGRATULATIONS to every blogger that has made this Top Etiquette Blogs list! This is the most comprehensive list of best Etiquette blogs on the internet and I’m honoured to have you as part of this! I personally give you a high-five and want to thank you for your contribution to this world.